Filipino political prisoners still cry out for justice. DAVAO CITY, Philippines (Mindanao Examiner / Sept. 18, 2011) – An organization of former political detainees called SELDA criticized Davao City Mayor Sara Duterte after she was quoted as saying in a news interview that political prisoners are incarcerated because of crimes they committed and not for political reasons. 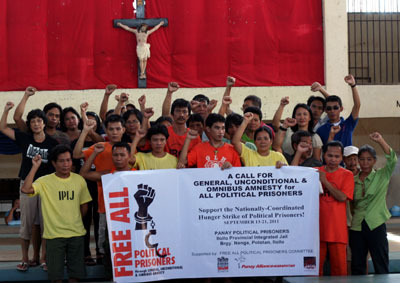 “Contrary to the statement of the young Duterte, the 360 political prisoners, including the detained National Democratic Front of the Philippines peace panel consultants, are falsely charged with common crimes and that they're actually incarcerated due to their political convictions,” said Fe Salino, Secretary-General of SELDA in Southern Mindanao. “Duterte's statement on political prisoners disappointed us because it seems that she is denying the existence of the raging civil war and the government's compliance to human rights instruments and international humanitarian law,” Salino said. Salino said majority of political detainees were farmers and that most of them were picked up by soldiers and presented as members of the rebel group New People’s Army. “It seems like we are still living in the dark days of Martial Law. Political prisoners are either innocent civilians or members of progressive organizations who were victims of illegal and/or arbitrary arrests due to their opposition to government's anti-people policies or they were wrongfully accused as supporters or member of the New People’s Army,” Salino said.